The properties of matter are typically the result of complex interactions between electrons. These electrically charged particles are one of the fundamental building blocks of nature. They are well researched, and theoretical physics has determined the electronic structure of the majority of matter. However, the behavior of matter under extreme conditions is still largely unexplained. Such conditions can be found in places where very high pressure and high temperatures prevail, such as in the interior of stars and planets. Here, matter exists in an exotic state on the border between solid, liquid and gas. A research group at Kiel University and the Helmholtz-Zentrum Dresden-Rossendorf has now developed a new method to describe the dynamic properties of this so-called "warm dense matter" for the first time. They have published their computer simulations in Physical Review Letters. Today, warm dense matter can also be produced experimentally in large research institutions, for example, by using high-intensity lasers or free-electron lasers at the European XFEL in Hamburg and Schleswig-Holstein. Powerful lasers are used to compress and heat the matter to extremes. It can then be examined using another laser. A measurement of the so-called X-ray Thomson scattering—in other words, how the laser beam is scattered by free electrons—makes it possible to determine many properties of warm dense matter, such as its electrical conductivity, or its absorption of radiation. However, this requires a comprehensive theoretical understanding of warm dense matter, and in particular, of the so-called dynamic structure factor of the compressed hot electrons. To date, science has not been able to describe this reliably and accurately. The interaction of the various factors that play a role here is just too complex at temperatures of up to 10 million degrees Celsius, and a density usually found only in solids. In addition to the intense heat, this state also includes Coulomb interactions, occurring when two negatively charged electrons repel each other, as well as numerous quantum mechanical effects. The research team under the direction of Michael Bonitz, professor of theoretical physics at the CAU, has now achieved a breakthrough. 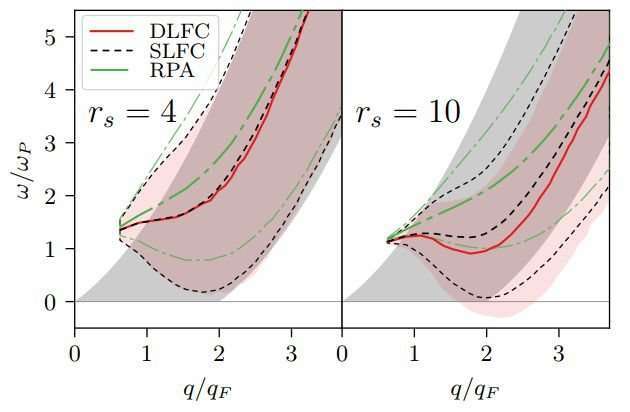 Using complex simulations performed on supercomputers, they have developed a computational method with which they precisely described the dynamic structure factor of electrons in warm dense matter for the first time. To achieve this, they further extended their own quantum Monte Carlo simulations, developed in recent years. "Our new data provides unique insights," explained Bonitz. "Remarkably, it has already been shown that the exact description of the repulsion between negative charges results in a significantly modified Thomson scattering signal, in particular to a drastically changed plasmon dispersion, compared with previous theories." These predictions will now be checked experimentally. The results thus obtained are of extraordinary importance for the interpretation of state-of-the-art experiments with warm dense matter, such as those beginning shortly at the European XFEL. For example, they can be used to determine key properties such as the temperature of the electrons or the velocity of propagation of waves arising when matter is bombarded with lasers.